Today London’s official art world is full of enthusiasm for so-called ‘minority art’, made by artists of guaranteed ‘minority origin’. On the whole, however, the artists so defined and officially promoted don’t come from Asia. Some big international art stars of Asian extraction – Ai Weiwei from China, Yayoi Kusama from Japan – have been able to crash their way into our major museums, but it’s increasingly left to top-of-the-line commercial galleries to promote new talents from the Far East. One reason for this is that Far Eastern artists don’t, in fact, come from definable minorities. In their own countries, they are part of the majority. Another, quite different, reason is that a small handful of top-of-the-line commercial galleries are in fact more fully international than any British institution. They do the big Asian art fairs. They are quite likely to have a gallery space in Hong Kong. The elegant Chiharu Shiota exhibition currently at Blain/Southern’s space in Hanover Square offers a case in point. The artist is Japanese and has lived in Berlin since 1996. She represented Japan at the 2015 Venice Biennale and was shown at the Gwangju Biennale in 2006 and the Yokohama Triennale in 2001. She has exhibited extensively throughout the world: Adelaide in Australia, Bergen,, Dusseldorf, the Sackler Gallery in Washington, MoMA PSI in New York. One particular reason for welcoming her here is not simply that she is a woman, and things are going big for female artists in Britain right now, but also that her chief material is thread. That is, what she does offers a direct comparison with the Anni Albers show currently at Tate Modern. It must be said that the exuberance of the piece that fills the main space at Blain/Southern entirely dwarfs anything by Albers you might encounter at the Tate. 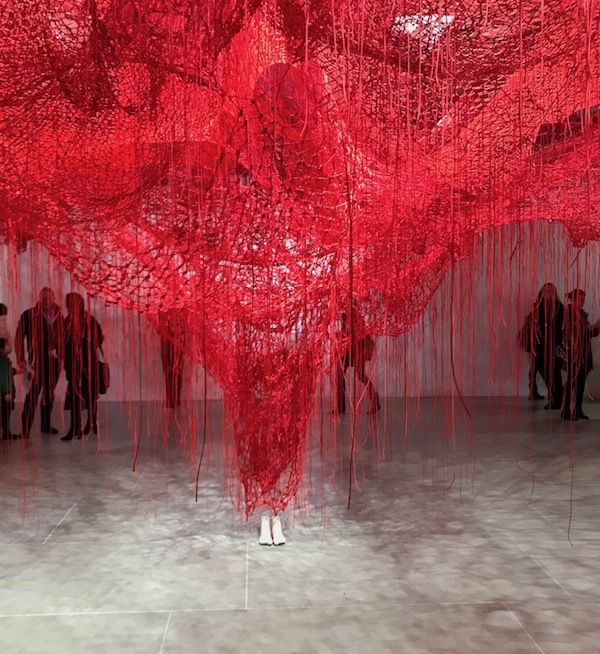 It is a vast, exuberant canopy of scarlet threads, suspended high above your head, but meeting and dwindling down to a spot in the floor, where the threads are anchored to two small bare feet, casts made from the artist’s own. It seems if you read it as rising from the floor, rather than descending to it, like a metaphor for the creative energy that the artist feels bursting from within herself. The items in the next, slightly smaller space are more subdued. There is a glass case with an elegant full-length dress. Entitled State of Being, it’s the sort of costume you could imagine being worn in bygone times by England’s own Queen Elizabeth I. More red threads occupy the lower half of a big panel to create something you might perhaps read as a version of an oriental ink-and-brush landscape. That is if it wasn’t for the colour and the slightly sinister title that says Skin. The combination of title and image might transport you to a London institution other than Tate – the Ashurbanipal reliefs now on view at the British Museum – the scene of prisoners being flayed. In fact, there’s plenty here for the imagination to play with, though it’s canopy that seizes one’s imagination. It’s always nice to meet ran artists whose work makes one dream. Did I say that the title of the piece is Me Somewhere Else?